Done decluttering? Great because this week we’re moving onto part two of our April spring cleaning series: Organization. For those of you who haven’t quite finished the decluttering process, don’t forget to reference last week’s blog. Have you ever looked for a household item where you usually leave it lying around just to find that it was placed in its correct place within your home? You’re not alone. It’s always shocking when items that have laundry rooms as temporary homes find their way into the room they’re intended. Spring cleaning gives your items an organizational reboot moving them to an official spot with similar items. From small kitchen utensils to desk organization, there are so many variations for homeowners to reference in their quest to achieving ultimate organization. Screw a metal magazine rack to the inside of your cabinet door to organize long boxes like plastic wrap and aluminum foil. Place a small tension rod under your sink to add an extra shelving layer for spray bottle cleaning supplies. Unfortunately, the best way to organize your junk drawer: placing similar items in individual drawer containers or dividers. This rack is the perfect way to organize flat sauce pans without directly stacking them on top of each other. The best way to increase space on the side of your fridge is by labeling tall condiment squeeze bottles with your typical selection. Organize your water bottle cabinet with a plastic wine rack. It does the trick! Closet organization is not a necessity, but rather a preference to make your mornings easier. Picking out clothes becomes less of a hassle when you can visually see all that you have to wear. Insert these dividers between stacks of sweatshirts, sweatpants or purses that sit on top of your shelves. The most basic way to condense your closet is by purchasing these velvet hangers that keep your clothes off the floor and latch onto one another. Use binder clips to slide belt buckles onto for the ultimate belt organization system. Another way to organize purses is with S hooks that hook onto clothing rods. For all of the handymen, it's best to purchase some sort of small or large toolbox depending on the degree of your fixing capabilities. 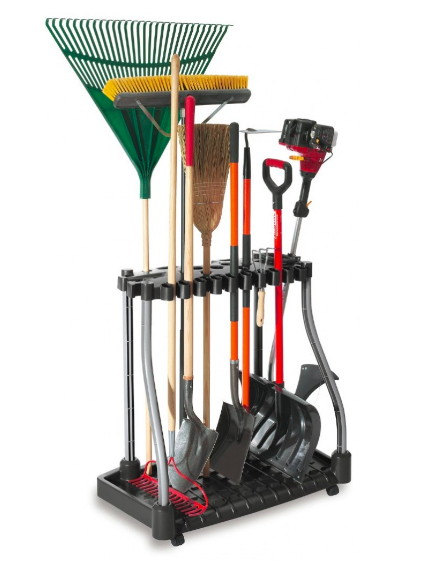 For larger yard tools, find a tall stand to place them. Install a pegboard or put pegs in the wall to utilize the wall space in your garage. A common mistake homeowners make is trying to push their bikes to each side of the garage. Screw in a bike specific holder into your wall to hang them instead and save more valuable space. Purchase small magnetic strips and attach them to the garage's toolbox to easily attach and detach small pieces and parts. Label EVERY container in your garage so you can keep items stored away without having to spend excessive time searching through each bin. Colored washi tape makes for a great labeling device to tell your computer charger apart from your phone charger. This DIY printer shelf is an awesome idea to keep all printing essentials in one neat area. Color code your files and label them in similar groups with binder clips attached to the top. This way you can easily sort your files while looking down on them in a filing cabinet. The best way to organize your desk's version of the kitchen's "junk drawer" is by first decluttering all that you don't need and next separating what you do need into drawer dividers and containers. Don't forget to purchase organization after decluttering because you don't want to end up with unused storage bins lying around in your crawl space. Before putting these ideas to work, see what you have left from decluttering and plan out the organization you need in that desired space. Remember, you can only be efficient in this step of spring cleaning after the decluttering process.